Any parent with young kiddos knows that a long road trip has the potential for disaster. This is especially the case for those of us with kiddos who rarely sit still. My little guy is busy, busy, so when we started planning a camping trip several hours away from our home, I knew that I'd need to plan some entertainment/distractions (some bribes were also involved, haha) for along the way. 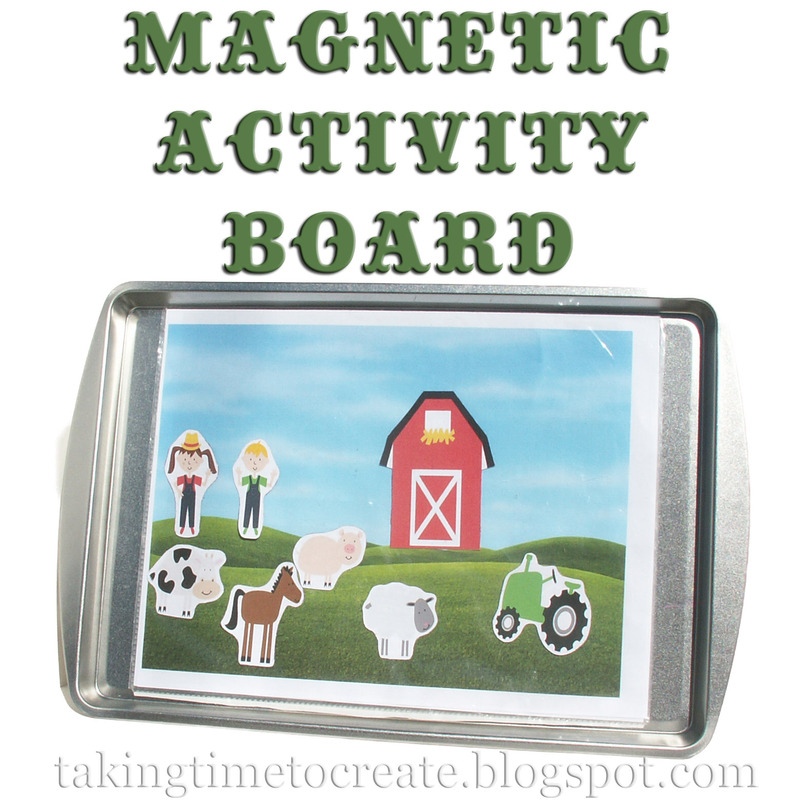 Today, I'm going to share with you the Magnetic Activity Board. This idea isn't unique to me. 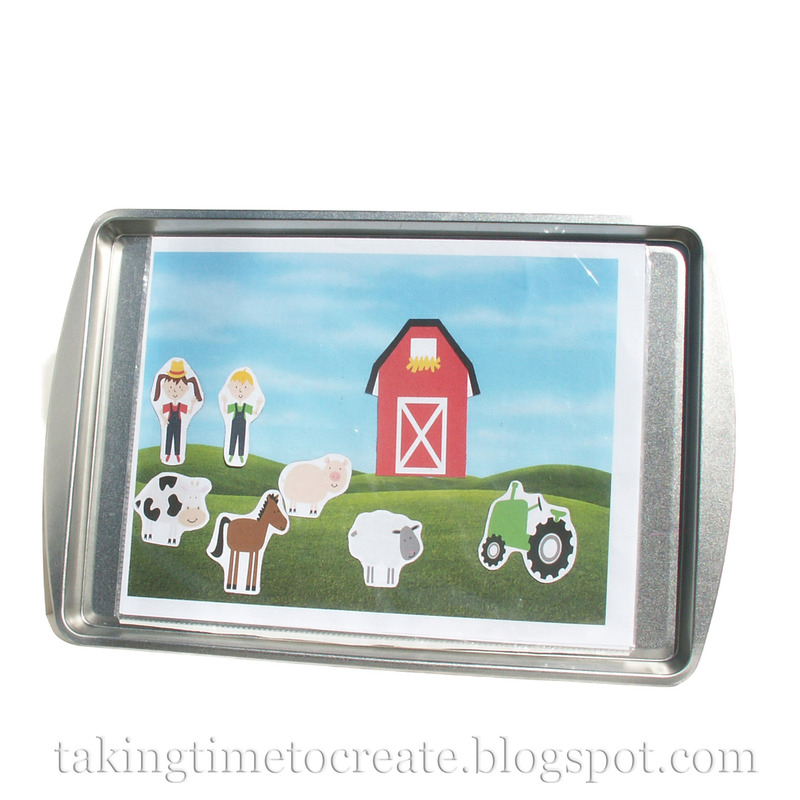 Lots of moms have discovered the beauty of using a small cookie sheet to entertain their kiddos. I mean, all you need are some magnets, and it's instant entertainment! 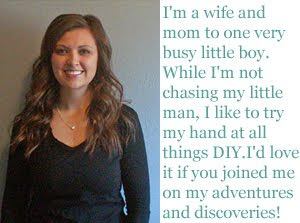 Ashley from Make It and Love It took it a step further and made Magnetic Paper Dolls for her little girl. This is where my inspiration started. Since I don't have a little girl but liked the idea, I tried to come up with ideas for boys. The first thing I decided was that I wanted to be able to change the background on the cookie sheet (which, by the way, I was able to find at the dollar store). That along with the fact that I didn't trust myself to draw something, led me to search for backgrounds to print. Now, how would I attach them to the cookie sheet? Page protectors of course! I attached magnets to a page protector and trimmed off the edge with the holes for placing the page protector in a binder. Make sure you don't cut too close; you want to maintain the pocket of the page protector. I used a sticker maker to basically turn magnets I already had (the kind you get on a phone book) into stickers and "stick" them to the page protectors, but you could also use magnet sheets that already have adhesive on them. It worked like a charm. Now I can change the backgrounds easily and have the option to not have a background at all. Here are the activities I put together. I Googled an image for the background. I honestly can't remember where I found it, but I think I searched for "grass and clouds" in the images section of Google search. Then I printed the first page from the Preschool Farm Pack from Creative Preschool Resources. I attached the pieces to magnets using my sticker maker, but you could also print them directly on printable magnet sheets. Then I cut them out. All done with the first activity. Aren't they cute? The whole Preschool Farm Pack is really cute. You should check it out if you have a moment or two. I printed two of these and two of these. I just saved the images and printed them on a full sheet of paper. I created magnets with one set of each of the shapes and used the other set for the "background" in the page protector. Then my little guy was able to match the shapes (or not match them as he's doing here). A couple months ago or so I printed several pages from the Zoo Tot Pack from 3 Dinosaurs. They're all so cute, and we've enjoyed them so much. I decided to use one of the matching pages and pieces that went with it as one of the activities for our magnetic board. I just turned the matching pieces into magnets. Easy peasy and they're so cute! Using the page protectors for the backgrounds made me think of the Dry Erase Busy Book I made several months ago. The same idea could work here too, so I attached magnets to another page protector specifically for coloring. I already had coloring pages printed, but the lion page pictured came from here. These dry erase crayons worked great and were much less messy than dry erase markers. My little guy thought it was tons of fun! I also made magnetic cars and printed a race track, but all the cars seem to have disappeared. Here is the image I used for the race track. I used clipart cars and Googled images of Disney Pixar's Cars as well. The magnetic activity board was a HUGE success! I think we'll be using for all road trips, dinners at restaurants, and maybe even as a rainy day activity. It's so versatile. You can come up with all kinds of activities for it. I hope you all enjoyed this post, and if you make (or have made) a magnetic activity board of your own, I'd love to hear about it! 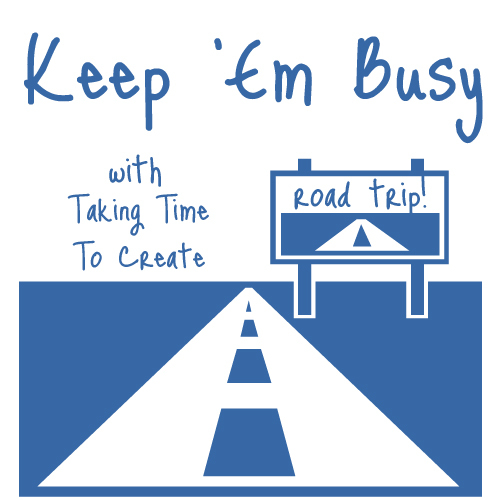 Tomorrow, I'll have a few more ideas to Keep 'Em Busy on a Road Trip. Hope to see you back here then! What æ great idea! Loved the Matching Zoo animales, it will work for kids at every age ;o)Have a great weekend! I think you're right about kids of every age. I'm hoping to be able to use it for years to come. You have a great weekend too, Mayen! Wow...you are brilliant! I wish I would have thought of this when my kids were little! This is SOOOO cute! Thanks for sharing---definitely adding to my to-do list! 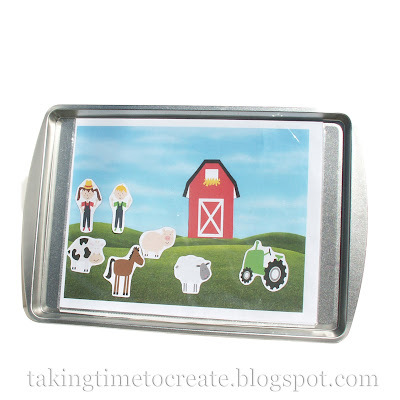 I have been wanting to make something like this for awhile now - I have even bought the cookie sheet! - but I just haven't gotten around to deciding what kind of activities I want to make to go with it. Yours are adorable. Thanks for the inspiration! Love these ideas! Thanks so much for sharing them! You're so welcome, Michelle, and thanks for stopping by! Wow Erin!! How fun is this!! So many fun possibilities!! My girls would love this! This is great! I have used the cookie sheet for magnets before, but never to this extent--so clever! If you're interested, I'd love for you to share at my Teaching Time Linky. Great ideas! Who knew a simple cookie sheet could be so handy. Thanks for sharing at Etcetorize this week! What an awesome idea!!!! I love it! So many things you can do with this! What a great idea! I never knew about the cookie sheet idea. Thanks for sharing on Marvelous Mondays! I love how you used the Zoo Matching! I do something similar with my youngest! Thanks, Cassie! And thanks especially for the great printable!